Building Information Modeling (BIM) has been proving value to Owners, designers, and pre-construction teams the world over. When project teams properly deploy BIM in the design and construction process, teams experience enhanced collaboration and improved information sharing. When coupled with visualization and mechanical, plumbing, electrical, and fire protection systems coordination, all project stakeholders experience a savings of time and money. While BIM tools have been widely adopted in the office, their use on project site in the past has been limited due to hardware, software, or a narrow understanding of the benefits. Recently, we have found that BIM can be just as impressive on the project site as it is in the office. 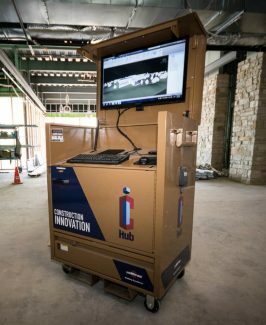 Miron Construction has realized greater efficiency and collaboration on project sites that utilize our new Construction Innovation (Ci) Hubs. Miron’s Ci Hubs are essentially modified gang boxes equipped with a TV monitor, computer, printer, and file-synchronizing software. A complete synchronized system provides the construction team with the building information model and the digital drawing set right where they need it, just in time, and always current. Crews are trained to use the unit and provide everyone on site (including subcontractors) with increased efficiency due to the ability to not only view plans, sections, and details, but print them! Miron’s investment in people, equipment, and technology help deliver projects more efficiently, safely, and with higher quality for all project stakeholders. The Ci Hub promotes collaboration and better communication. Serving as a “hub” for innovation, it will continue to play a pivotal role in future project success.